One of the positive features of competing is that it puts the practitioner outside the comfort zone: away fom the dojo, performing in front of officials and judges (s)he doesn't know, and facing competitors never seen before. For those who have no aspirations for the glory of sport martial arts, I do recommend attending seminars or especially visiting another school to train at. Different styles, instructors, and even surroundings can have a way of bringing a fresh perspective to your art, or re-kindling a semi-extinguished fire after what could be burnout from a long period of training in the same place. Not necessarily an extended stay, but a day or two here and there. Most dojos charge a mat fee for a single class and will accommodate a visiting student from another school. This practice is hardly new, and actually has roots dating back to feudal Japan. The classical warrior performed musha-shugyo - traveling the countryside in a nomadic fashion, training in various ryu (schools) to not only test his already acquired skills, but to develop new ones. Most students will express hospitality and natural curiosity upon the arrival of a visitor from another dojo/style. This practice creates good relations with other schools in the area, plus it could entice students from the visited school to come train at yours. But before anyone embarks on their own version of musha-shugyo or decides to become a martial ambassador of good will, understand that there will be some that may misinterpret your presence as somewhat contentious, especially if you're a black belt. "Who's this guy? Let's show him what real training is" might be the attitude of the fear-based collective of certain schools. Speaking from experience, things can get out of hand, even if you don't fancy yourself as a gunslinger or troublemaker. If training with indignant total strangers who are bent on displaying their sparring skills isn't really to your liking, you could always just watch the class. You won't have to break a sweat, you'll be able to observe from an objective point of view, and best of all, it's free. "The classical warrior performed musha-shugyo "
I've done this sort of thing, but I called it "Dojo hopping" for lack of a term at the time. I made sure to contact, and introduce myself to the Instructor way before I visited his/her dojo to explain my reasons behind my visit, and to ask their permission to attend. I would inquire as to whether they would like me to wear my colored belt, or to wear a white belt in respect to the fact that I do not belong to their system. To this point, every single Instructor has allowed me to wear my rank level, but I was more than ready to place a white belt around my waist without feeling demeaned. I walked into each dojo with a humble heart, and a willing spirit. I'm not there to teach anyone that my style is superior. I am there to experience, and to walk away with what knowledge I could acquire. So far, I have earned joy, respect, and a welcoming reception at every single place that I have visited. I have learned that the skills that I have amassed over my years of training in my style allow me to adapt, create, and learn from the other arts. I will not become an aikidoist from just a visit to their dojo, but I can understand just how complex, and intricate their movements are, and how similar they are to my own techniques. Suddenly I can see possibilities open up in my mind of what my movement is capable of achieving. I understand exactly what you are saying. There is definitely something to be learned by going outside of your comfort zone, even just a little bit. Several months ago, when I was part of a leadership seminar that had one of the chief masters of our organizations training us, well, it's a little intimidating, but you wonder if you can stand up to the pressure because you don't know if what you've learned at your little home school is up to the standards of what is expected from the highest levels. Or, even if your training is, if YOU can keep up. I was lucky that I put the effort in, because I was barely at the intermediate level, and most everyone else was a black belt, most were 2nd degrees or higher. In the end, I think the C.M. respected the fact that I was trying very hard, and that I took the interest that I did when asking a question during a Q&A session, and chatting with him after the whole day. Very nice guy, and he gave me plenty of assurances that I did well under the circumstances, and encouraged me to continue and be vigilant in my studies. But it was certainly eye opening, since I didn't know what to expect, and it was a case of being put to the test! I myself have dabbled in aikido, in fact that was one of the examples I was working from for my post. While I wouldn't dream of donning my karate gi and obi in an aikido dojo, I have in schools that teach related styles to my own. I've always received the welcome mat in schools that teach styles other than my own. Believe it or not, it's other Isshinryu people that rub me the wrong way. That, and the fact that men will always be perceived and treated very differently than women in the martial arts, or in anything else for that matter. You bring up a good point. It's always tougher training somewhere else that does your style than a different one; alot is expected of you obviously, and there's a good chance you're being sized up. I've certainly experienced some of that. I'm glad everything worked out for you. Take it on the road. I like it. Going outside the comfort zone is fun in modern times. Competing is fun too. You get to a level in your comfort zone, take it on the road with stress and intensity, come back with more knowledge and wanting more. Ready for more, in fact. Or knowing what to work on. Then, when you get to the point where you have to perform said things in a stressful environment, you're ready! having already done it elsewhere. It's like a rehearsal. Plus, you meet great people with lots of talent, get a good show and have fun. As much as I dislike the sport aspect of karate because of the kind of skills it devellops (subject to debate and what you want out of MA. I just don't like what you learn in point-sparring. 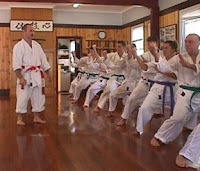 I much prefer bogu kumite), I greatly appreciate the social aspect of sport karate and the stress level it provides. But at the same time, it's stupid. Ha, writing this, I realize just how much of the zen way of thinking seeps through the MA training. Interesting. It's an educational exercise. It works too. Time to practice wild things, and strange ones too. Good for ma. I have been a martial arts itinerant off and on for the last 15 years. Even though I run my own school, I would take the time to visit other schools for various reasons. In the last 15 years i have only encountered one instance where I was faced with a very aggressive sparring partner that was not holding back. I did get smacked around a bit, but the worse is that because I wasn't in my best fighting form ... I had poor control, and ended up hurting him badly - I punched him in the side of the neck. Apparently he had to be sent to the hospital, but I didn't inquire any further. The lesson here? Is that if someone pushes you out of your comfort zone in any dojo ... feel empowered to stop your participation at any time. Some people don't know themselves. You should have a matured view of your own ability and what you want to accomplish. But yes. Wholeheartedly agree. Seminars, cross-traiing, discussions, and even social outings are just great! Point matches drive me crazy. What's amazing is that more injuries seem to occur in point sparring than full contact. I've never tried bogu kumite, but the old timers talk about it. There's a kempo school near me that use bogu. The martial arts and Zen are interwoven. Much of it has to do with the warrior's need to remain present, a fundamental principle in Zen. Welcome to my site. Regarding your sparring mishap: people generally get what they deserve sooner or later. These things happen. I've witnessed my share of heavy kumite sessions that ended with some pretty nasty injuries. Unfortunately, the hurt pride and bad feelings that result often remain long after the physical wounds have healed. Thanks for your input. If I can get off topic for a second, I wanted to let you know it looks like I'll finally be trying Tai Chi! Let me know how it goes. Although I've never tried it, there's alot of health benefits attributed to this ancient practice. Good Luck! As there is no set grading syllabus for BJJ, instructor rate your worthiness on a combination of things... the time and effort you put in, your skill in training, and sometimes most importantly, how you do in competitions. They are the ultimate pressure testers... like you say, against people you don't know, in front of people you don't know. You find out if you can really do it or not. At my school in Japan, the trend seems to be, you can't advance your belt until you get gold in a comp at that level. Tough but, in my eyes, fair. In the Russian art of sambo there is a similar emphasis on competing and earning rank. A Brazilian jiu-jitsu school in Japan (if I'm reading you right), now that's impressive. A testament to the effectiveness of this art. Good luck to your training.